Production and supply of IMO 2020 compliant 0.50% sulfur bunkers has begun in the major world bunkering hub of Fujairah. In Notice to Mariners 254, released Sunday and provided by NSI's 2020planning.com, the port said product would be available from February 2019. The new products come in addition to the compliant gasoil products already available at the major port. 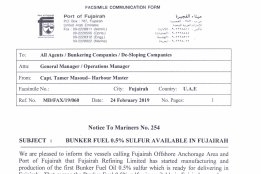 "We are pleased to inform the vessels calling Fujairah Offshore Anchorage Area and Port of Fujairah that Fujairah Refilling Limited has started manufacturing and production of the first Bunker Fuel Oil 0.5% sulfur which is ready for delivering in Fujairah," the notice reads. "That means the Bunker Fuel 0.5% sulfur is available in Fujairah as early as February 2019 onwards."